Geiri verified this one and made a cool demo! On his build, the gain pot is wired in reverse - that has been fixed in the layout below. 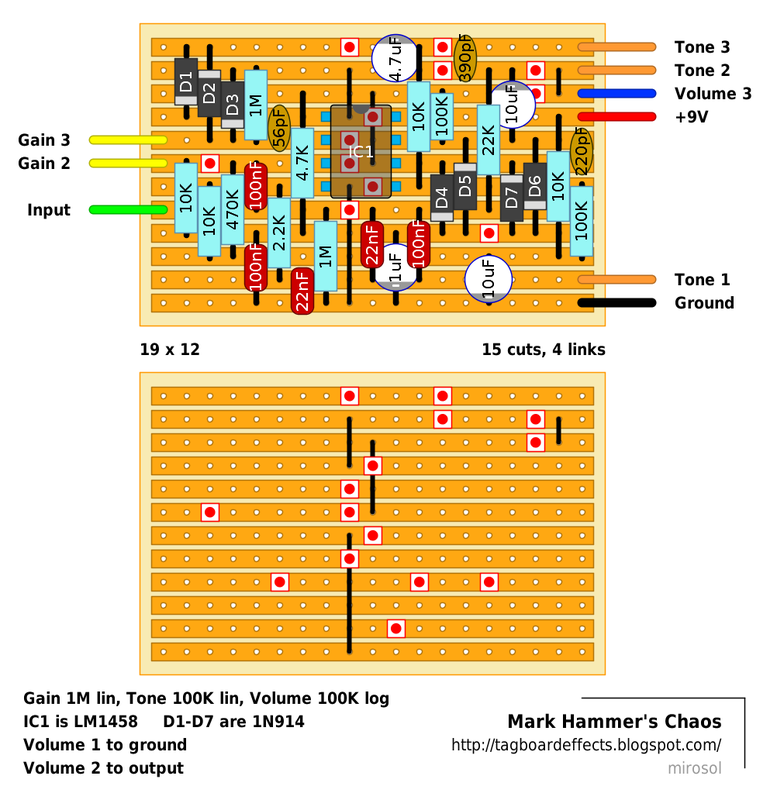 Mark Hammer's Chaos Distortion is turning 10. From Mark Hammer: A friend's son wanted a heavy-metal kind of thing so I thought I'd try and do something from scratch using a cookbook approach. I liked the tone control in Alexandros Charissis' "Ballz Booster", so i used that, but it became apparent that the passive loss of this tone control would need either a very hot signal or additional gain recovery. I opted to use two cascaded op-amp clippers to bring the signal level up enough that it could still push an amp, and add sufficient sizzle to make the kid happy. To make sure that the diode clipping would produce enough volume, I used a 2+2 back to back pair for the final stage since that wouldn't clip until a much higher threshold. The first stage uses asymmetrical clipping for no special reason, other than wanting a balance between larger output and not needing too much gain from the first stage. It applies gain up to 101, with a high end rolloff at 7.2khz. Nothing terribly magical there but since the first stage lops the wave at a maximum 1.5V peak-to-peak, I needed to bring the level up to get enough clipping using a pair of diodes. The Ballz Buster uses a 220pf cap on the treble side of the tone control and I found it didn't have enough presence for me. A slightly higher value of 390pf fixed that and gives plenty of mid-bit. At the bass end, it gives a nice round chunky tone. I like it. The ton is surprisingly flexible, ranging from vocal-sounding grind at low-gain, bass setting to searing over-the-top headbanger tone at high treble, high-gain settings. At max gain and output it is a couple db over the level of the straight signal, so it won't pummel your amp. I used lowly 1458 dual op-amp for no special reason and it sounds decent with little hiss. It might conceivably sound better with a different op-ampm but quite frankly, the double clipping masks whatever differences there might be between op-amps. The Vref is simply midpoint of the supply voltage, using a pair of 10K resistors and a 10uf cap to supply the Vref. 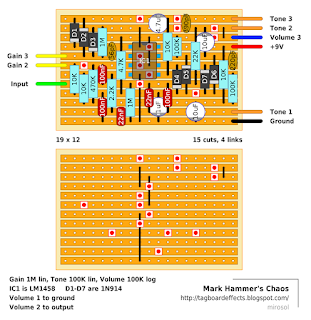 The Gain and Tone pots are linear and the Volume pot is a log. I wouldn't consider it my favourite fuzz, since i'm not a big fan of metal, but it does the job well and can be VERY intense. If your pickups are microphonicm this will let you know in a hurry. I guess the most interesting feature is that the use os a low-ish rolloff in the first stage means that at lower gain there is less high end and mids to clip in the second stage. Turning up the gain doesn't provide that big a level boost but it starts to present the second stage with a clippied sound that has much more midrange and treble content, yielding a different sounding clipping, not just more clipping. Between the different clipping qualities and the neat tone control, a lot of flexibility for just three controls. I'd recommend to socket the opamp and try on a variety of chips. I think there should be noticeable difference between LM1458, AD712, NE5532 and TL082. Build this today, all works good, maybe a bit more of volume will be cool, in case you need to drive more a amp. Just need to check what to do with Gain 1 Lug. That lug needs to be unconnected or chained with gain 2. Either way. For more output, you could try upping the 100K resistor above D4 for 220K. Thank you. I chained gain 1 with gain2. It´s a bit muffled for my tastes, the tone control deserves a better usable range too. Besides i am not a good player I will try to record something in a few weeks, just to register it, it´s difficult to find samples of that pedal. Just built this and I have a problem I wanted to run past you. First off I'm a new builder, I don't know exactly what subbing out some parts will do to an effect on a technical level, so I'll disclose everything I did differently here. The problem is ALOT of noise coming from the effect, bypass is obviously no problem so not cables etc. I ran through the normal trouble shooting, no bridges, no missing parts etc, but I have used a few different ones. The most questionable is that the 1uf Electro cap on mine is a mylar film. I didnt have an electro on (is in the mail). I also have some poly film ones, could this be the issue? other thing is the 2,2k resistor (again in the mail) I popped in a 4.7k one as the closest thing to my hand (do have 1k ones though). And finally the Opamp is a JRC4558 as its what I have loads of, I realize that it might create more noise than the suggested one, but the noise I have here is crazy. Also no grounding issues etc. Something obvious Ive missed or is it just a matter of waiting for the correct parts. The 1uf cap in particulair (power filtering or something). It´s a really noisey unity. And get´s radio too. It was dismantled. There are a lot of better circuits. Really loud pedal and actually an alright thrashy fuzz. Unfortunately a bit bassy for my liking. Any suggestions as to what caps or resistors to mess with to reduce the bass on this it? Thanks in advance. Sorry should have mentioned i used LM1458 for IC and 1N4148s for diodes. I also had to put a 33pf and a 22pf in parallel to get close to 56pf. This pedal could be amazing with some minor tweaks i reckon.